Prices are still up this month over last year’s values (4.9%) just not as much as they were last month (5.6%). Home Prices are NOT Falling. 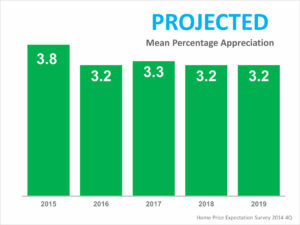 As a matter of fact, the latest Home Price Expectation Survey by Pulsenomics (a survey of a nationwide panel of over one hundred economists, real estate experts and investment & market strategists) showed that home prices will continue to appreciate for the next several years. Both first time buyers and families thinking of moving-up to their dream home can be assured that their investment in their new home makes sense.